You deserve all the colourful goodness of the world! And that is why we bring an iridescent beauty to you! Flaunting shades of the rainbow, Abalone shells become the most entrancing jewellery adornments that make the admirers gasp! Get them all here at TJC. Shell Jewellery dates back to the earliest times of the civilization. The earliest documentation of ornaments also mentions the glorious and picturesque beauty of shells. Abalone shells reflect a mesmerizing play of colours and lustre that makes them one-of-a-kind in all ways that matter. With the shimmering surface of blue, green, and purple, the shells prove to be versatile fits for almost any occasion. The harvesting of these shells has been done since times immemorial. This particular kind is sought out from the sea and the shells are procured from a snail. 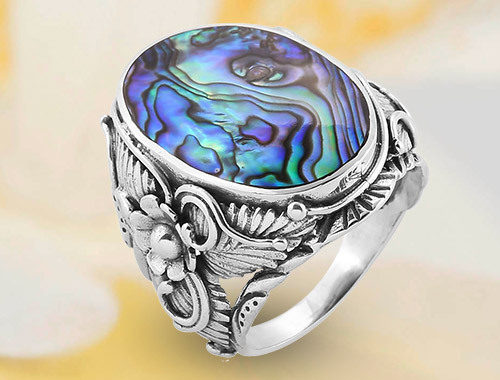 Abalone shells are the organic gemstones that are harvested from a group of mollusks, which are called haliotis. Abalone, a kind of sea snail, started out being harvested as a food source. It were the locals who realised how incredible the iridescent lustre of the shell was and started using it as embellishment for jewellery. After a while, the gem reaped in so much popularity that it had to be farm-grown to meet the wide demand. In the present time, Abalone can be found at almost all coasts, except Antarctica. The best quality imports are from Australia, China, Japan, New Zealand, and Thailand. You can find these shells in abundance in the mentioned places where they’re sold not only as a part of jewellery but also for decoration. Having said that the shells display all the colours of a rainbow, the hues that stand out the most are blue, green, and purple. These are also the colours that stay on top of the most coveted varieties. The shells rate 3.5 on the Mohs scale of hardness, which means that they need care and attention. They are very susceptible to scratches and abrasions on the exterior, so you will need to take of the jewellery. Now, when it comes to the availability of size, these shells can vary. They may be tiny short of an inch and they can scale up to seven inches. Because of their low strength, they prove to be easy to cut and crafted into most shapes as required. There are several cultivators across the globe who breed these snails for the food source as well as for the jewellery. So, you can find a vast variety. With a long-term history as timeless as Abalone, there have to be several legends speaking of the importance in terms of physical and mental well-being. For a very long time, Abalones have been feeding the folk and their shells have been used for several purposes. Some of the legends and healing tales have been mentioned below. Abalone shells are famed to balance the emotional struggles that one goes though. It has always been believed that if one wears these shells in time of any problems related to emotions, one can find instant peace and stability. It carries an unlimited supply of positive energy and protection that guards you against bitterness and despair. In some tribes, it is believed that if you burn sage in the shells, you messages and prayers reach till heaven. In the Apache tribes and culture, Abalone shells are used in the celebrations of a girl through her of rite of passage for when she becomes a woman. People also believe that they can invoke the spirits of ocean with the help of these shells as they’re the oldest connection to the seas. One can also clean their aura and chakras whilst using the shell with burning sage in it. The process of cleaning the shells is fairly easy. All you have to do is soak the shell in warm or lukewarm water and add a little soap to the mix. If you feel like there’s some persistent grime and dirt on the shell, you may choose to use a soft-bristled toothbrush to scrub. After rinsing it with soft hands, pat down the shell with a soft cloth or chamois cloth. The stone retains its lustre in no time at all. Abalone shells have been used for food and jewellery purposes since the times that man can recall. They’re not only easily found, but their shells have a hypnotic lustre that appeals to everyone. They rank 3.5 On the Mohs scale of hardness. This entails that they’re not the strongest of the gems and can easily sustain scratches and abrasions. They have been regarded reverently for their healing properties as it is believed that they have miraculous effects when it comes to emotional turmoil and instability. They’re found abundantly on all the coasts over the world, excluding Antarctica. Although they’re available in all the colours of the rainbow, the most popular variations are with the hues of blue, green, and violet.